Harry Oldmeadow's excellent accounting of Western encounter with Asian religious traditions continues to prove gripping. I think his best chapter is 'Christian Missionaries, Monks and Mystics in India' that focuses on the four noble spirits of Jules Monchanin, Henri Le Saux, Bede Griffiths and Thomas Merton. This is neither simply because they are figures close to my heart (and unfolding narrative) but they are (you may equally surmise) close to the author. He has also written individually an excellent book on Henri Le Saux/Swami Abhishiktananda. Fr Bede I knew, though we did meet, mainly through correspondence and for being a patron of the Prison Phoenix Trust: geographically the most distant, in practice the most active most especially writing to people in prison (by return) in his spidery but clear hand. I recall our first meeting. I had prepared a series of serious questions that I might appear profound (or, at least, marginally intelligent) and they all evaporated as inconsequential in his presence: humorous, still, holy. It was a memorable lunch and afternoon that left you several inches off the ground. But it is Thomas Merton who continues to exert the deepest influence. What to make of this extraordinary man? A contemplative addicted to writing, a solitary addicted to people: his autobiography is one of the small of number of books that I have read through without pause into the early hours, more than once. Like any torrential writer, his work misses sometimes, but when it strikes home, it does so with such precision and grace that it remains with you, burrowing away, breaking you open to new realizations in its wake. It is this passage (from his 'The Asian Journal') that I want read at my funeral. 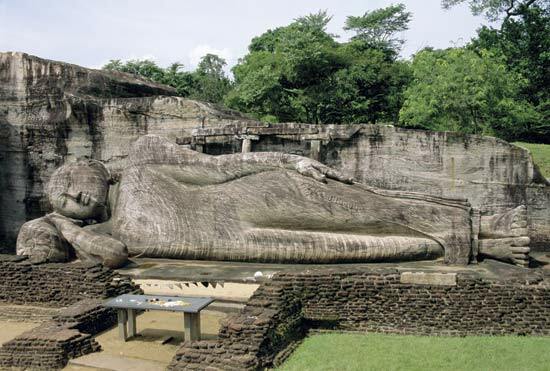 It tells of a visit to the great Buddha statues at Polonnaruwa and a moment of illumination. "The path dips down to Gal Vihara: a wide, quiet, hollow, surrounded with trees. A low outcrop of rock, with a cave cut into it, and beside the cave a big seated Buddha on the left, a reclining Buddha on the right, and Ananda, I guess, standing by the head of the reclining Buddha. In the cave, another seated Buddha. The vicar general, shying away from “paganism,” hangs back and sits under a tree reading the guidebook. I am able to approach the Buddha barefoot and undisturbed, my feet in wet grass, wet sand. . . . Looking at these figures I was suddenly, almost forcibly, jerked clean out of the habitual, half-tied vision of things, and an inner clearness, clarity, as if exploding from the rocks themselves, became evident and obvious. the queer evidence of the reclining figure, the smile, the sad smile of Ananda standing with arms folded (much more “imperative” than Da Vinci’s Mona Lisa because completely simple and straightforward.) The thing about all this is that there is no puzzle, no problem, and really no “mystery.” All problems are resolved and everything is clear, simply because what matters is clear. The rock, all matter, all life, is charged with dharmakaya. . . .
Everything is emptiness and everything is compassion. I don't know when in my life I have ever had such a sense of beauty and spiritual validity running together in one aesthetic illumination. 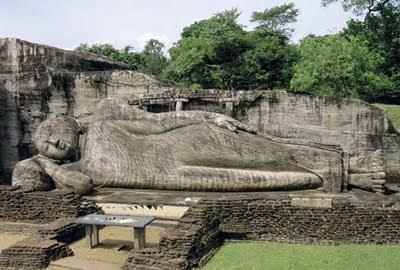 Surely, with Mahabalipuram and Polonnaruwa my Asian pilgrimage has come clear and purified itself. I mean, I know and have seen what I was obscurely looking for. I don't know what else remains but I have now seen and have pierced through the surface and have got beyond the shadow and the disguise. This is Asia in its purity, not covered over with garbage, Asian or European or American, and it is clear, pure, complete. It says everything; it needs nothing. And because it needs nothing it can afford to be silent, unnoticed, undiscovered. It does not need to be discovered. It is we, Asians included, who need to discover it."